How do I purchase the 3-for-1 Kids' Special? The 3-for-1 Kids' Special can be bought from our tour offices in Cape Town (stop 1, 5 and 8) and Joburg (stop 1). They can also be bought online. If you're in Cape Town, there are two 3-for-1 specials: the Classic bus ticket and the one-day Harbour or Canal Cruise ticket. 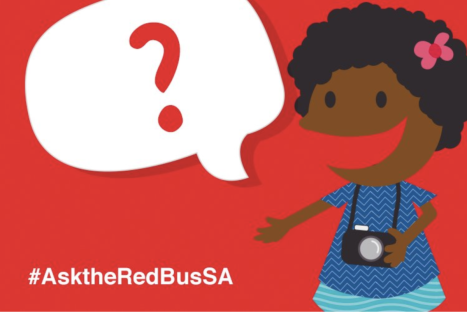 In Joburg you can choose between two options: the one-day red bus ticket and the one-day red bus and Soweto Combo tour ticket. How do I redeem my online tickets? To hop on, simply print out your ticket and present it to the bus driver where you'll also receive your kids' tickets. Don't have a printer handy? Bring your barcode number to a City Sightseeing tour office and redeem your one-day adult ticket and kids' tickets. Alternatively, have your barcode scanned by your bus driver as you hop on the bus. In a nutshell, you'll receive the adult ticket online and the kids' tickets on the day only. Adults and kids will each receive their own set of earphones to listen to the commentary on board. Commentary is available in 15 languages, and includes a special channel for children.